In the Domain Driven Design world everyone points to the ubiquitous language as paramount to the success of the project. However, often the developers fall under the pitfall of the technical jargon; the business assumes the developers have all the necessary business knowledge, given incomplete requirements; combining all these communication problems leads to frustration, missed opportunities and ultimately to project failure. Given the miscommunications and misunderstandings between the development and the business, several questions arise: how can you learn to communicate and closely cooperate with the business, or even better be part of the same team? Also, how can you help the business to deliver a clear vision? 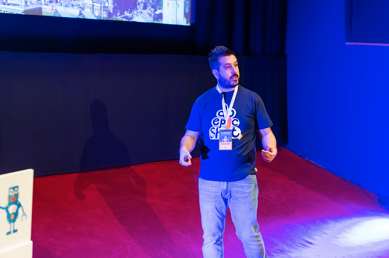 In this session, João will show you how to engage the development team and the business using DDD tools and techniques, using Behaviour Driven Development as the central piece to bring everyone closer. If you have a similar experience, or you want to emerge into DDD & BDD, the session is for you! João Rosa is a Software Developer working as Consultant at Xebia, focused on delivering quality software that matters. Believes in the software crafts to provide software in sustainable peace; he is a DDD, BDD and TDD practitioner. He can't live without his CI/CD pipeline. During his career he always pushed the teams and himself to improve the communication, reducing the gap between developers and the business.When he is not on his duties, you can find him travelling with his wife, or laying down on the beach reading a book. João is an amateur cook in his remaining time.